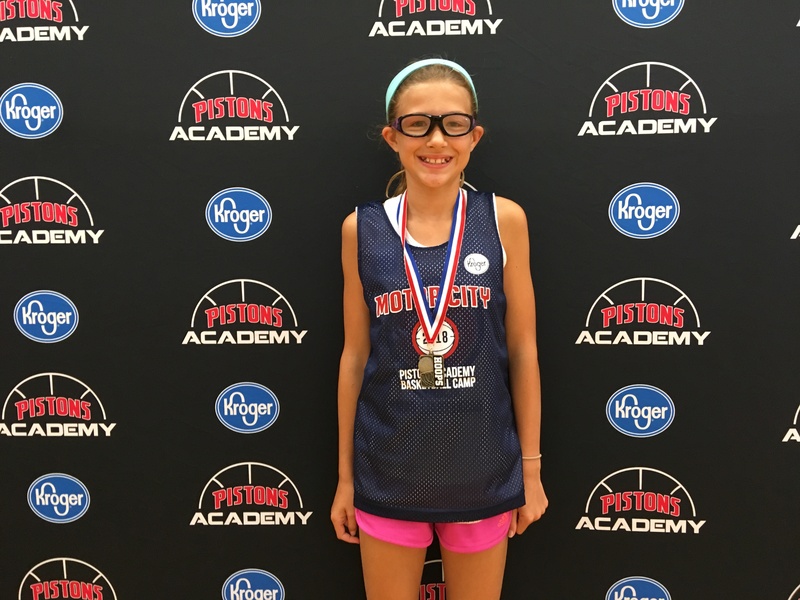 The Pistons Academy summer basketball camp tour, presented by Kroger, makes it’s annual stop at the All-Girls camp in Birmingham. Tuesday at the All-Girls camp in Birmingham proved to be another day of hard work and dedication from our talented group of campers. “We are fortunate to have such a great group of kids this week,” said Camp Coach Beth Mac. “They have been really focused and are eager to learn as much as they can from the coaches,” she added. Day 2 featured an emphasis on handling the basketball, as the day got started with Coach Bryan’s ball handling warm up. During stations, the campers learned the nuances of the “Pick-and-Roll” and began implementing some of their new knowledge into the 5-on-5 team play. “We told the story of Kobe Bryant and his legendary work ethic this morning,” said Camp Director Bryan Bollin. “Our goal is to motivate and inspire the campers to work their hardest in everything that they do, whether it’s on the basketball court or off the court,” he added. Another highlight of Tuesday was our “Dream Wall”, where campers were challenged to envision their future and write down their “dreams”. There were plenty of fascinating goals and dreams for the future, and campers were encouraged to pursue those dreams however big or small they might be. Parents are encouraged to check out the dream cards hanging on the gymnasium wall over the course of the week. Congratulations to Addison Wolfe, our Player of the Day on Tuesday! Addison has been working very hard and has demonstrated leadership, toughness, and determination. All players must wear their reversible jersey to camp each day. Plenette Pierson (former WNBA player) will be visiting camp on Wednesday from 12:45-2:30pm to speak to the girls and work with them in stations/skill development. There will be a “Q and A” with Plenette from 2:10-2:30pm. Family and friends are welcome to attend. Check-in begins at 8:40am. Due to a summer school program, we will not have access to the gym until 9am. Camp will be dismissed at 2:30pm on Monday-Friday. There will be an awards ceremony at 2pm on Friday. « Ladies Take Over High Velocity with strong play!